EV3 Intelligent Brick also features an infrared port, a 178×128 LCD interface, a USB host port and SD expansion slot, and is now compatible with iOS and Android for remote control via Bluetooth 2.1. Thanks to 6 buttons present on the EV3, users can now program many functions directly, in addition to the ability to download programs from a desktop computer. Lego claims a simple robot can be built in 20 minutes without having to plug it into a PC. Beside EV3 intelligent brick, the set comes with 550 Lego Technic elements, infrared, color and touch sensors, 3 motors, and a remote control. 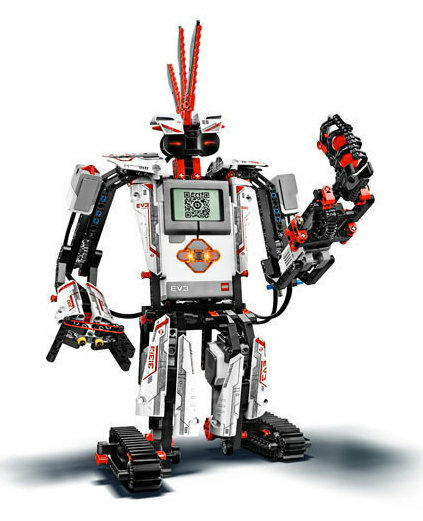 LEGO MINDSTORMS EV3 will initially include building instructions for 17 different robots such as “Everstorm” a Mohawk-sporting humanoid that shoots mini-spheres as it walks (Pictured above), “Spiker” a scorpion-like robot that searches for an IR beacon “bug” or “Reptar”, a robotic snake that slithers, shakes and strikes. Builders can then add LEGO Technic pieces, motors or sensors to change the functionality of the robot. Watch the promo video below to see what can be done with Lego Mindstorms EV3. MINDSTORMS EV3 also provides a new 3D instructions apps (iOS only for now) powered by Autodesk Inventor Publisher that allows builders to zoom in and rotate each step in the building process. The new desktop programming interface is backward compatible to earlier NXT bricks, offering object-oriented programming tools and extensions to major robotics languages, and should be available for Windows and Mac. LEGO MINDSTORMS EV3 will be available for $349.99 US, “349.99 and $399.99 (CAD) in the second half of 2013. You can check out the Brochure for more details. An education version “The LEGO MINDSTORMS Education EV3 platform” will also be released later this year for educators interested in teaching robotics in middle and high school classrooms. More information on LEGO MINDSTORMS Education EV3 can be found at www.LEGOeducation.us/MINDSTORMS.